Few weeks ago I was contacted by CRES Wellness to try out their latest Slimming Lipo Cavitation Treatment that promises effective, measurable weight loss in one treatment! 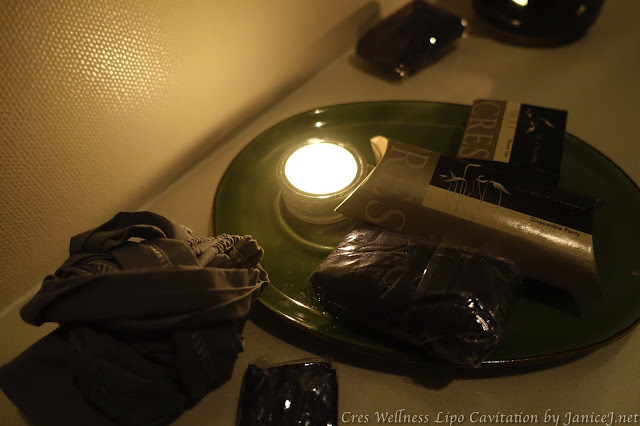 My previous collaboration with CRES Wellness was pleasant, and if you have not read my review on Aqua Cell Yoga Visage facial, read it now! Before the treatment, I googled about Lipo Cavitation and I am impressed by the results. However, I am a little skeptical about all these slimming claims as they look more like marketing tactics to me. I am believe that most people will feel it that way as well. However, there is this saying, 愛美之心人皆有之 :P My love for perfection led me to try out the treatment. I have stubborn fats to target especially those visible places like arms and thighs. Knowing that Lipo Cavitation helps to break down fats and shape the body, I decided to try it on my lower body. 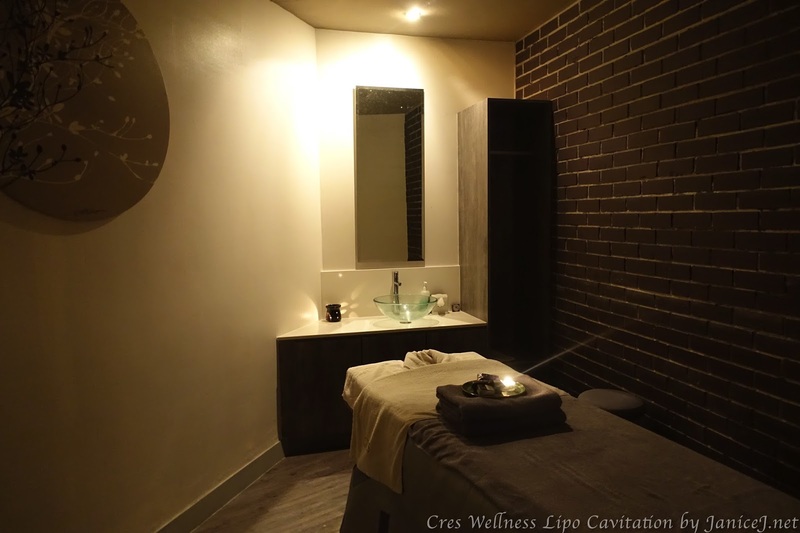 Located on the forth floor within the heart of Mid Valley City, the staffs at CRES Wellness The Gardens welcomed me as usual when I walked into the salon boutique. Before the treatment, I were seated and served with a cup of tea to quench my thirst while I fill up a form. Basic informations and some other details were asked. Since Lipo Cavitation uses strong ultrasound waves to break down stubborn fats, those who have current or past medical concerns especially metal pieces in body are advised to not undergo the treatment. The staffs are very particular on these minor details and they will re-make sure again and again so that there will not be any complications after treatment. After the consultation, I was asked to keep my belongings into a locker space and the staff ushered me into the treatment room. The softly lit room is really relaxing while soft background music was played. Before proceeding with the Slimming Lipo Cavitation Full Treatment, I were asked to remove all metal pieces like jewellery from my body. Next, I changed into the disposable G-string and a tube top. 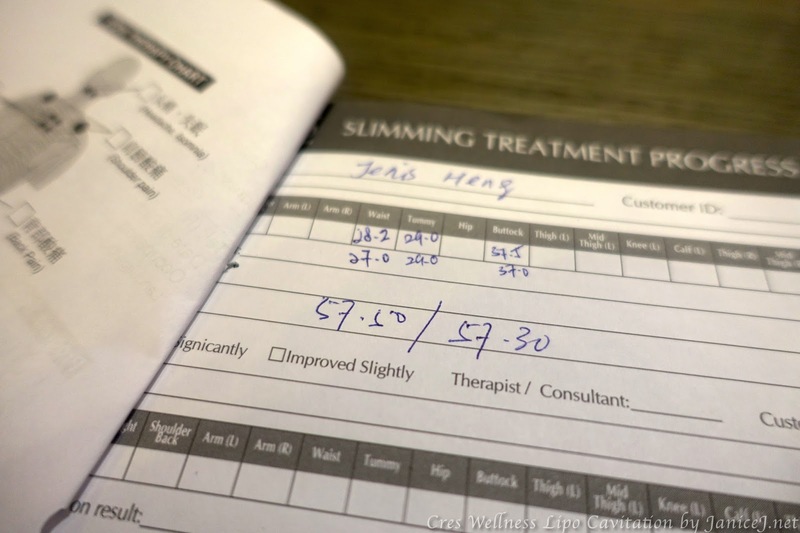 The therapist looked at my body and since I was reviewing the full treatment which allows me to target two areas (waist, arms, thighs or buttocks), she advised me to do it on my waist and back thigh. She then took measurements of these parts and also my weight to do a comparison of the effectiveness of the treatment. First, I laid down on my back and the therapist started the ultrasound slimming treatment on my waist area. She first cleaned it and used the first Cavitation on my waist. The machine uses strong sound waves of 40KHz to vibrate fat cells vigorously in which the air bubbles expand and break down the fat cells. These cells will then decompose into glycerol and free fatty acid. It will then be channeled out through lymphatic drainage system. This process is completely painless. I only feel slight tingling sensation during the treatment. Also, during the treatment, I heard buzzing sound. My therapist told me that when the sounds slowly die down, that mean that the fats are being broken down slowly. 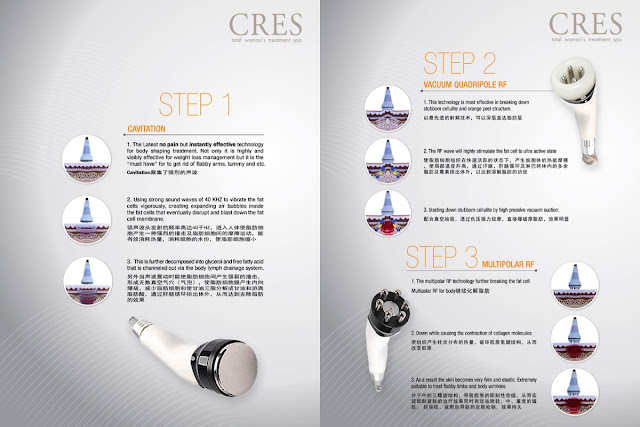 The following step was by using vacuum quadruple RF and multipolar RF. It helps to tone skin and further breaks down the fat cell by stimulating the fat cells into an active state. Other than the slight heat, I do not feel uncomfortable at all during the treatment. Therapist did half of my back thigh area and immediately I saw a huge difference. I feel super ashamed looking at the pre treatment part. The post treatment past is toned up and I even have the buttock smiling line. Lastly, I was wrapped up using a plastic wrap while lying in a heat blanket. I lost a total of 1.2in from the waist, 0.5in from buttock and 0.2kg. Skin was super refined and toned. I am really happy to look at the result. Interested? All CRES Wellness outlets are having promotion on Lipo Cavitation now. I've signed up for the RM399 part sessions. 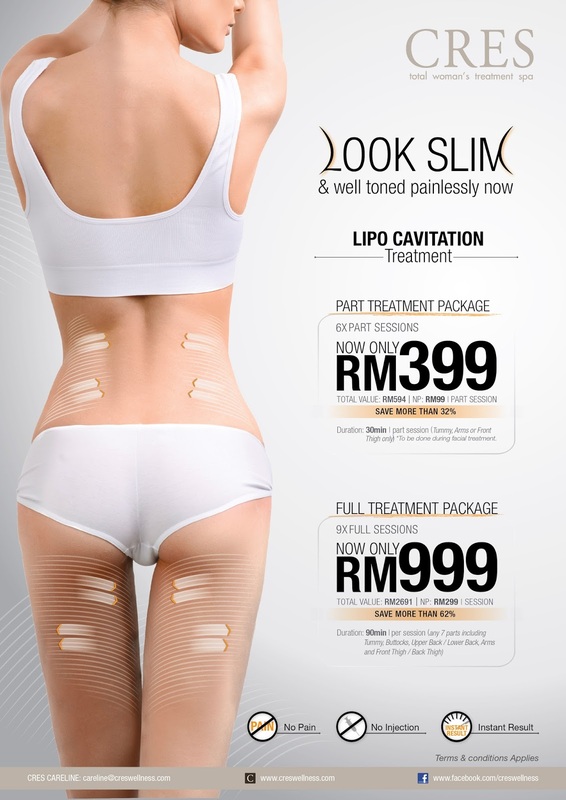 Those who wanted to try it out, you can try part treatment at RM99 per part, or RM299 for full treatment. I am so so tempted to sign up for their full treatment package. There are 9 outlets for you to choose from, operating daily form 10am to 8pm. Pros? Getting slimmer while relaxing. No injection, no pain and enjoy instant result. Great for working women who are too busy, and for those with flabby skins and arms. The treatment time is short, you can even go for the treatment during your lunch break. 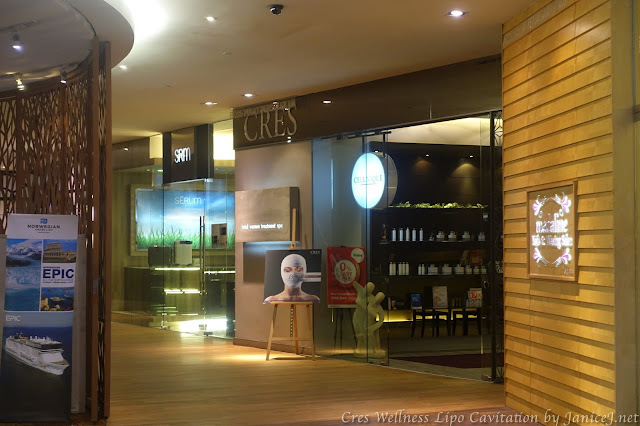 The good news doesn't end here, CRES Wellness is having their 12th anniversary event this 1st and 2nd August from 10am to 8pm at all outlets (except Gurney Paragon). Anyone who is interested can register online at CRES Wellness website starting 20th - 31st July. Just bring along your E-invitation card on the day of the anniversary event to redeem a free Slimming Lipo Cavitation Part Treatment and plenty of free foods, fun and games. You might also win products or vouchers from their Luck Draw or Grand Draw on that day! The people whom wants to become slim and fit used many medicines available in the market but found no result even after serving the huge amount of their incomes on it but there is a therapy called Physiotherapy North Ryde which makes them fit and healthy and they looks good, slim and smart after taking the physiotherapy which is not costly than the other medicines.